Content is king, and YouTube has a lot of it. If virtual reality is going to take off the way Google, Facebook, Samsung, Sony and a host of other smaller players think it will, it's going to need great content. Video games, Oculus' first focus, are a logical place to start, but it's clear now that VR will also need mainstream video content if it's going to be a hit. That puts YouTube -- and by extension, Google -- in a pretty strong position of power. When the company's just-announced Daydream VR experience starts arriving in the hands of consumers later this year, a brand-new YouTube VR app will be front and center. 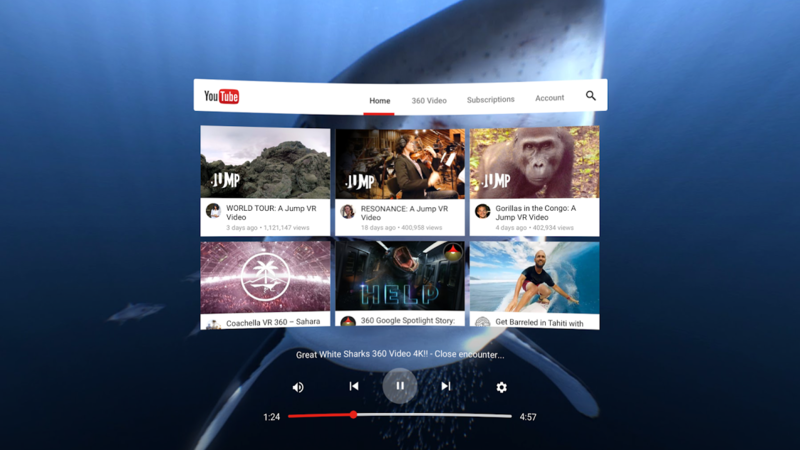 It took a year for Google to make YouTube more VR-friendly. Updates included 360-degree video (both prerecorded and live), spatial audio and the ability to view any video on YouTube when using Cardboard -- all things Google is drawing on in its new YouTube VR app. "What you're seeing now is our next step, which is taking all these early bets we made on the technology and bringing them to life in an experience built from the ground up for VR," says YouTube VR Product Manager Kurt Wilms. That "ground-up" experience is built on three things. The first is surfacing VR-ready content, with the home screen featuring personalized recommendations for VR videos as well as content with spatial audio. The second pillar is that all of YouTube will be available -- all of the videos as well as the features that are familiar to users. "Watching any video, browsing the home screen, the ability to sign in, your subscriptions and recommendations are all available," Wilms says. The last major component of YouTube VR is that the app was designed to make viewing sessions as comfortable as possible. "Unlike Cardboard, which we think of as 'snackable video,' this is built for longer sessions," says Wilms. This means there's a lot of customization to make the video "screen" fit your field of view properly. The app is also fully integrated with the Daydream remote, which means you won't have to use your head's movement to navigate through the interface (which is how Cardboard works). Nothing here seems wildly transformative, but Wilms stressed that Google went through a ground-up rethinking of how YouTube should be experienced when viewing it in VR. "The analogy I use is it's building an experience like we did for the living room," he explains. "YouTube on smart TV is obviously different than using it on your phone." The content may be the same, then, but each experience necessitates a different approach to how you use the app. That principle of building an experience specifically designed for VR applies to videos as well as the app itself. As I said earlier, content is king, and YouTube has a lot of it. You can watch anything on YouTube using a Daydream headset, and you can also watch any VR video from a phone or browser. The experience obviously won't be as immersive, but if users find content that excites them on their phone, they might be more inclined to upgrade to a VR headset down the line. "Instead of having an admittedly narrow [virtual reality] audience that we have today, you actually have the opportunity to reach a much broader audience," says Jamie Byrne, a director in YouTube's creators program. "What that's going to do is encourage people to continue investing in the space." Byrne believes that YouTube has "probably the deepest content library available to anyone who buys a headset," and that content continues to grow by leaps and bounds. Case in point: The number of VR uploads to YouTube is doubling every three months right now. Byrne also thinks we're in the early days of virtual-reality experimentation, much like we were with user-uploaded video on YouTube a decade ago. It remains to be seen what types of content end up being the most compelling to VR users; YouTube is trying to solve that puzzle. "We want to work with creators, from the biggest partners to the smallest to help them learn and experiment," Byrne says. "We want to help discover what's the 'beauty tutorial' or the 'let's play' [gaming] videos of VR that no one could predict today," he continues, referencing two of YouTube's most popular categories. To that end, Google says it's working with creators to help them get their hands on VR-capable rigs like the GoPro Odyssey, not to mention Google's own Jump Assembler software for stitching together VR footage. Additionally, YouTube's LA and NYC studio spaces are now equipped with Jump gear, and creators can apply to book time there. Byrne says there are plenty of enthusiasts building their own VR rigs, but YouTube wants to make shooting and processing complicated VR footage much easier. After all, the more people out there are making VR video, the better off YouTube will ultimately be.